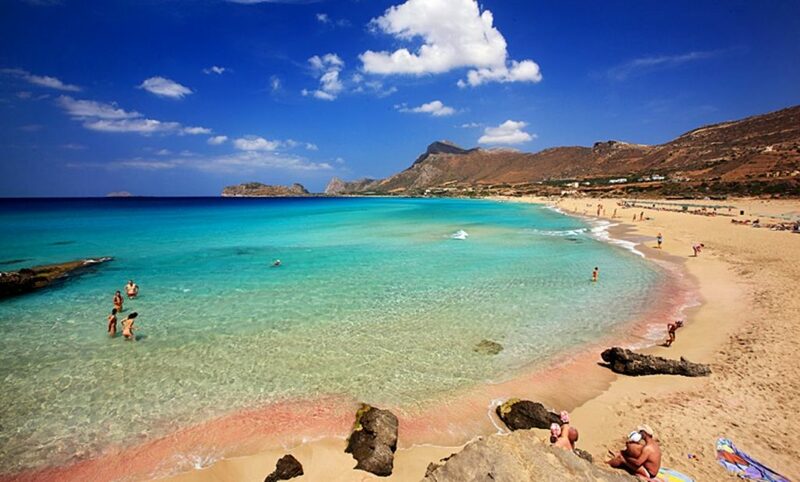 The exotic beach of Falassarna is located 59km west of Chania and 17km west of Kissamos. It’s located in the western part of Cape Gramvousa. At the northern end of the beach are the ruins of the ancient Roman city of Falassarna. 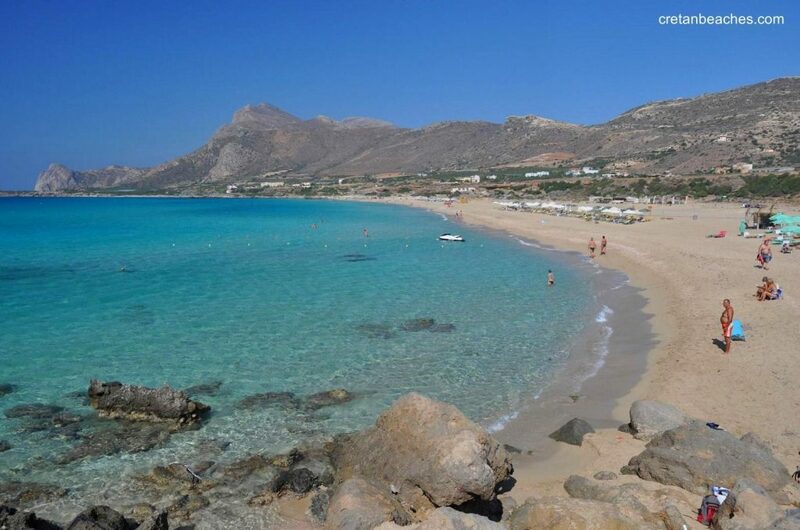 Falassarna bay is one of the most famous beaches in Greece, which has been awarded as the best beach of Crete and one of the 10 best beaches in Europe in the past. Falasarna spans a huge area and consists actually of five consecutive beaches, with the two most central being the most favorite. 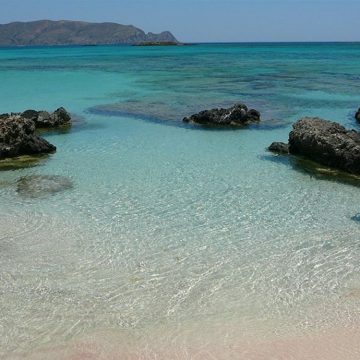 The sand in Falassarna is white, making the water color tropical. 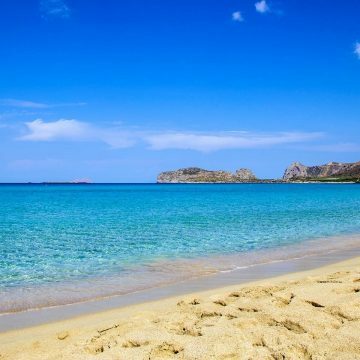 Indeed, if you’re lucky and be here on a day that is not blowing from the west, rare in west Crete, you will be enchanted by the beach and its turquoise waters. 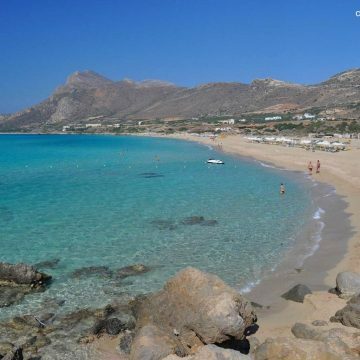 The main beach of Falassarna is called Pacheia Ammos (i..e Coarse Sand). 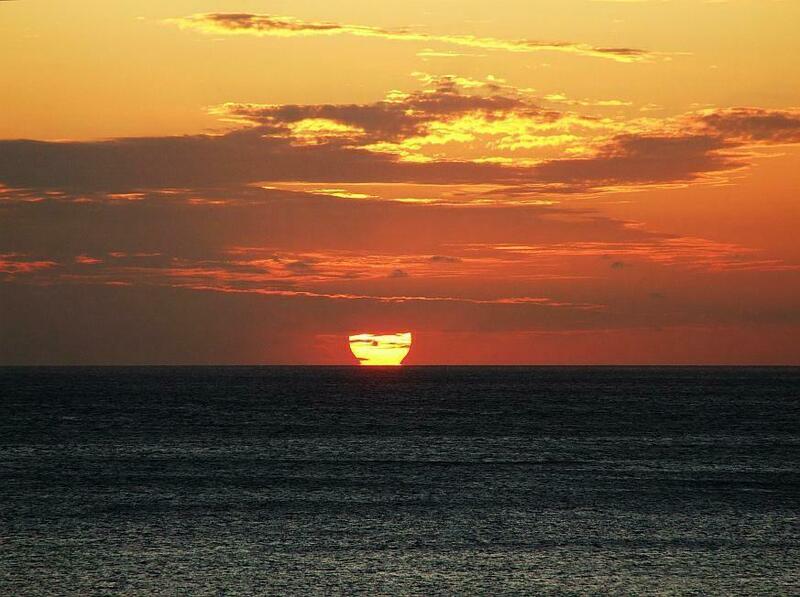 It is an exotic beach with a length of 1km and a width of 150m. This beach hosts the most visitors of the area, but because of its length it never seems crowded. The beach offers umbrellas and a few snack bars and cafes where you can get food and water. There are also services for water sports and a beach volley court. There is another long beach north of the main beach having a length of 800m, identical to the main beach, which is broken into several smaller beaches. This bay is divided in half by a sand dune and a few rocks. 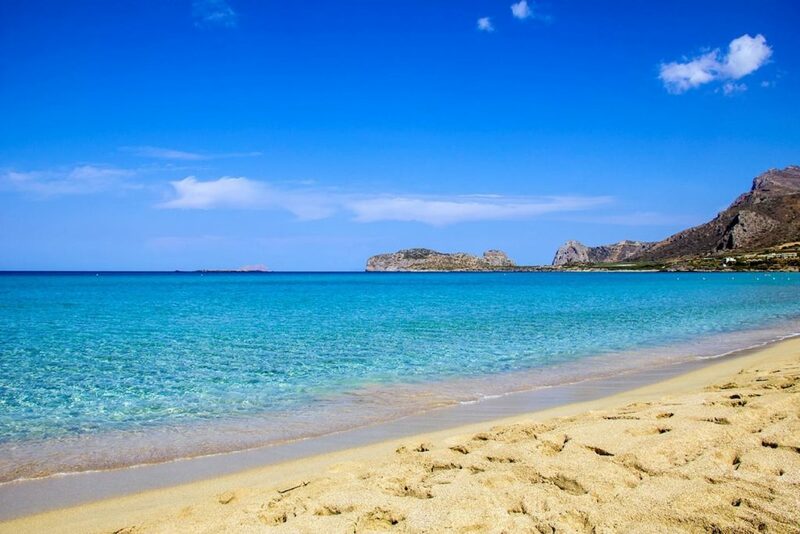 The beach is more quiet than Pacheia Ammos and offers no facilities. Nearby, there is the chapel of Agia Paraskevi and a spring with fresh water. Further north, near the archaeological site, there is a small cove looking south. It is pebbly and the seabed is rocky. It is a good choice when the winds blow from west or you seek isolation. 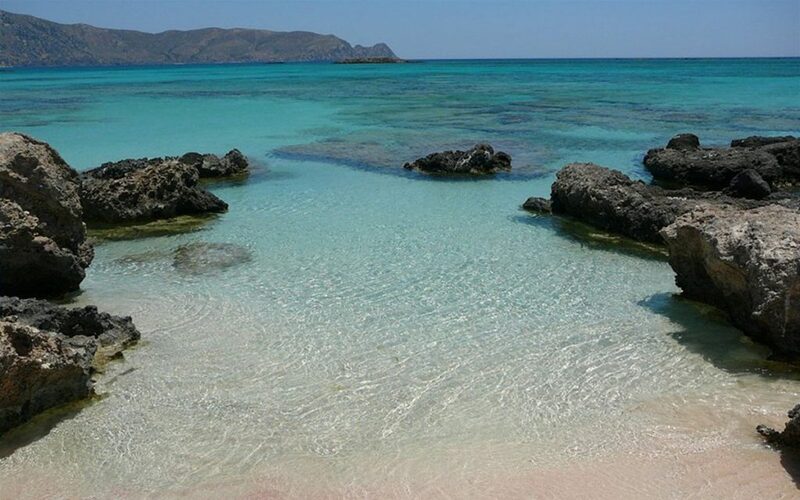 South of Pacheia Ammos, at Livadi, there is another long beach that has sandy shore and rocky seabed. It is a very good choice for fans of the snorkelling. Livadi is surrounded by a very important wetland with ponds, which host many birds in winter. Even southern, near the small harbor of Limeniskos settlement there is a small pebbly beach, which is a good choice if you do not want to stay remote. 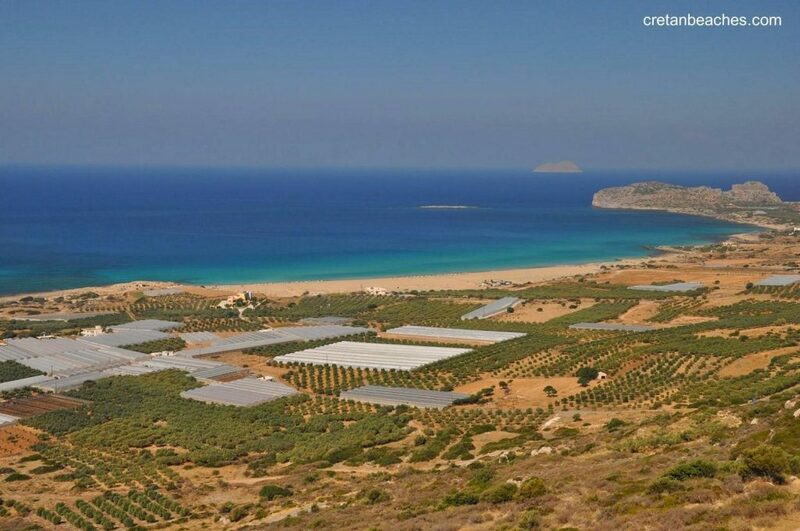 The area around Falassarna is magnificent and is a Natura protected region. 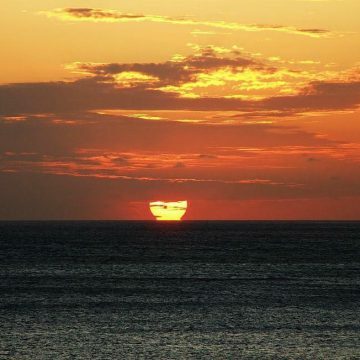 If you have time and looking for something romantic, you can wait for the sunset, which is considered the best in Crete. How could this not be the best, when being in such an amazing landscape and there is no obstacle between the beach the horizon? When it gets dark, you might be lucky to visit one of the several beach partys organized in Falassarna during summer. One drawback about Falasarna is that it looks west and is usually wavy. However, this is desired by windsurfers. There are also reports that the surrounding greenhouses pollute the sea with fertilizers and trash, which, if being true, is a real shame. 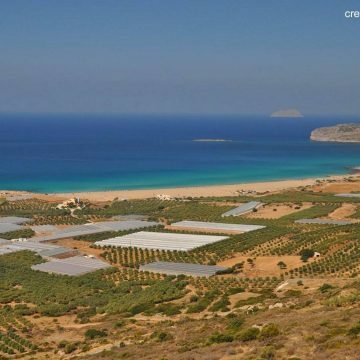 If you do not have a mean to get in Falassarna, you can catch the bus from Chania or Kissamos. Suncity hotel reception can help you book this excursion.